"Nature's beauty awaits us, rain or shine"
Come join the community of Sea Angel and the folks at R.U.M. 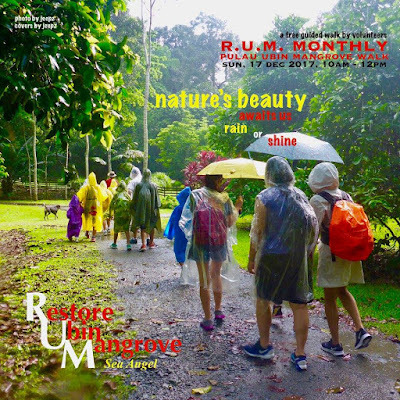 (Restore Ubin Mangrove) for this FREE morning walk along tranquil Kampung Tracks and visit the majestic Mangrove of Pulau Ubin. Escape the hustle and bustle of city life. Enjoy the fresh air while learning about the mangrove's impact on our ecosystem and marine environment. Easy leisure walk on flat ground and village tracks. The walk is on, rain or shine. Open for all age groups, children below 12 must be accompanied by parents. Registration is required for all participants. Book your place now and we will get in touch with you on the itinerary and walk details 3 days before the walk. For further queries, email ubinseaangel@gmail.com.